Years ago I taught many Stack 'n Whack classes. 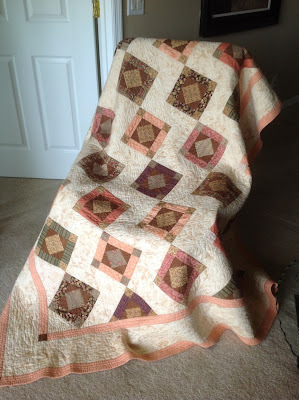 I was the first to show this kaleidoscope-style of quilting to my guild, thanks to seeing Bethany on Alex Anderson's 'Simply Quilts' HGTV show. I taught the course at my LQS, love this acronym, (Local Quilt Shop, for my non-quilting sister's benefit!) 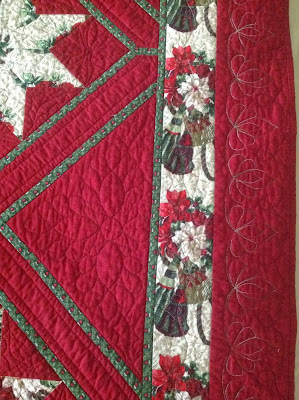 It was during the teaching of this course, that I first heard of gluing the layers of the quilt sandwich together. As I carefully explained how to tape down the backing, smooth the batting over it, and then lay the quilt top down, smoothing and squaring it, pin-basting about every 4", about the width of your fist, one lady piped up suddenly, "Have you heard of spray glue? I just spray glue the three layers together! Then you can quilt away. You can throw the quilt in a corner, leave it in a heap for a few days, come back a few days later, and pick up quilting where you left off! When you're done, just throw it in the machine and the glue washes out! It changed my life!" I looked at her like she was from outer space. Spray GLUE?! Are you INSANE?! Well I thought that but all I really said, was, "Really?! I've never heard of anything like that. Tell me more!" Meanwhile my mind was whirling: quilt without every getting jabbed by a pin, or breaking a needle on a pin, or breaking your fingernail trying to close the safety pins?? I'm IN! So, she told me about Sullivan's The Original Quilt Basting Spray, as well as 505 Spray and Fix. Sulky does make kk2000, but I haven't used it for a long time. Well, that very day, on the way home from teaching that class, I stopped and bought some 505! 3. gumminess that was a little difficult to scrub off our fingers, we were ecstatic with the results. Ecstatic. It held beautifully, did not gum up the needle, and gave no issues with the Sulky Holoshimmer thread I used to quilt mine. The first quilts basted with QBS were quilted on my darling old faithful, Elna, bought in 1979, that I still have, and that still stitches beautifully. She loved the QBS. Now, I know there is the school of thought that you should NOT put chemicals on quilts, what could happen to the fibres over time (remember issues with indigo dyes? ), what about discoloration, a spray glue is toxic and can be inhaled. All true. Leah Day does not believe in using them, see her excellent post with some very informative links here. And I love all things Leah. So it is definitely a personal choice. Personally? I LOVE spray basting. I have used Spray & Fix 505, Sullivan's QBS, as well as Sulky's kk2000, and once (shh! don't tell) I even bought a crafts spray adhesive at either Lowe's or Home Depot and used that. (Well, it was half the price of the others.) It gummed up my needle most annoyingly, so I've stuck to the ones in the fabric stores ever since. I have never ever had an issue with the fabric yellowing. I have never had an issue of the glue causing any problems whatsoever with my quilts. And I have quilted many many quilts using QBS. 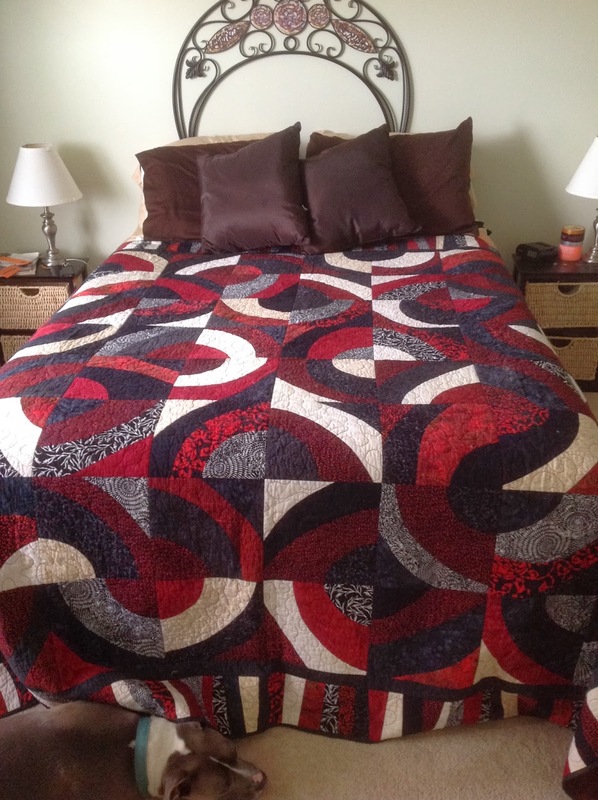 I have washed and washed the quilts, and all are just beautiful still. They range from bed quilts, to lap quilts, to wallhangings, tablerunners, and most recently, to tack my Snowman Placemats here and there. I love the fact that I can reposition my top either during the basting process, when the backing is still taped to the floor, or later, when I am quilting, and perhaps find an area that needs smoothing out. The tackiness remains, though not as strong as when you first apply the QBS, for some time. I also flip my quilts over once I've spray basted the layers, prior to beginning to quilt. I smooth out the backing to ensure there are no wrinkles. The basting spray allows you to do this with ease. 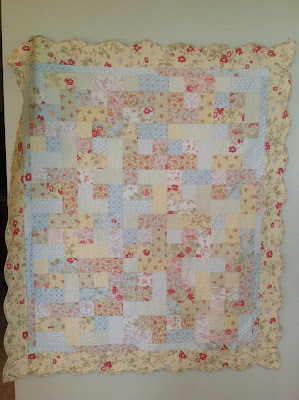 I found it so freeing to be able to quilt intricate designs without worrying about pins. I traced both the border and the triangle motif onto goldleaf paper (another aha for me) pinned it to the quilt top, and quilted away, not worrying about hitting pins that might have been hiding under the paper, had I not used QBS. This one has a flannel backing, flannels and some brushed cottons on the top, as well as the heavy wool snowmen heads, all of which were applied pre-quilting. The spray worked fabulously with these varied fabrics. 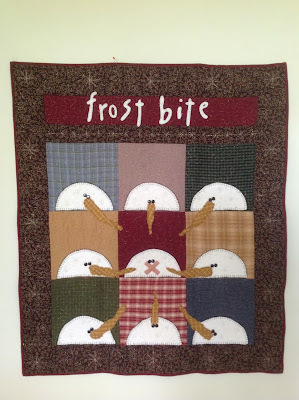 I quilted a couple of snowflakes with Sulky metallic thread, on each of the snowmen, no problems at all. 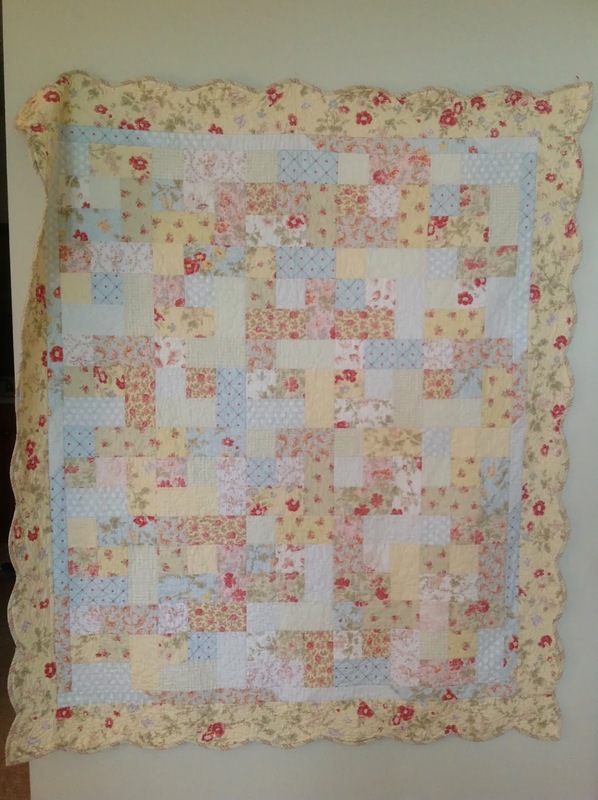 The ivory/tan floral fabric in this quilt was not affected at all by the spray. It still is fine today, no discoloration. "A Dent in My Stash...maybe!" 2009 65X75"
This one has a flannel backing. The adhesive performance of the spray was just as good as with a cotton. No name quilt 2012 90X91"
I was a little hesitant about using the spray with the ivory batiks in here, but there was not an issue. I've washed the quilt and put it in the dryer so it has a nice crinkle to it. The ivories are all great. Apparently Rocco thought his grey colouring showed off this quilt's colours! How in the world did I quilt such a monster on my DSM? By using my most favourite Aha! Moment tip (secret) yet. Stay tuned! I made the above quilt with an event in mind that did not occur, so I am going to try to sell it at the quilt sale in Sarasota in February. The top is 100% batiks and the back is a red with black marbling cotton. I quilted it with Sulky Blendables on my Bernina in a large all-over meander. The border is a vine-style heart motif. If I cannot sell it, it might eventually go to my grandson, who loves red. It's based on Karla Alexander's "Red Onion" quilt pattern in her Stack a New Deck book. I've made several from that book. Although I can't show you a picture of the oldest quilt basted with QBS, my Trip Around the World quilt, as it's up north in Kingsville, I can assure you that I have not experienced any issues with QBS on my quilts. These quilts are used a lot, washed at least once a year, sometimes more, have animals that snuggle on or sometimes under them, humans that wrap them around their bodies, legs, haul them around from chair to bed and back again, and all are surviving very well! 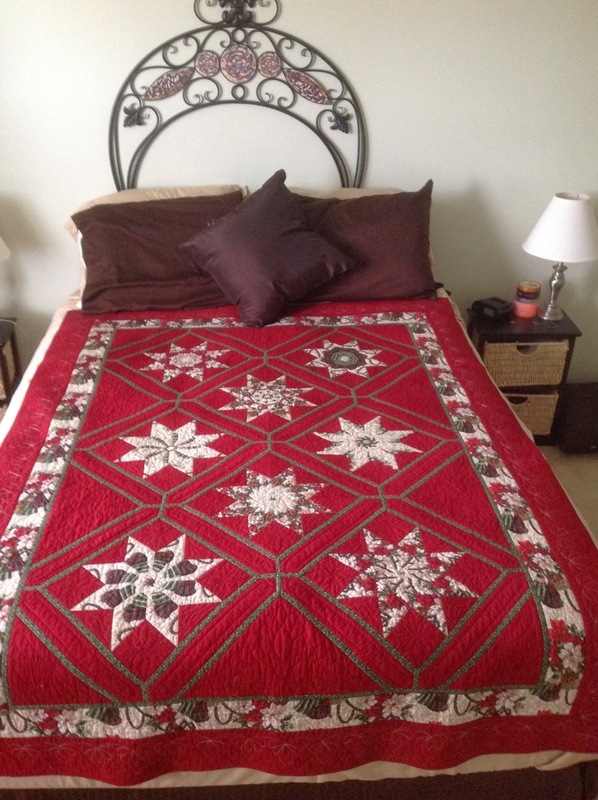 Since my Avanté remains in Kingsville, I will be quilting some larger quilts once again on my DSM. 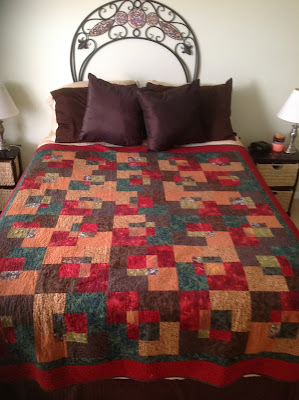 There is Laurel Burch wallhanging quilt that just needs quilting, as well as a large bed quilt, two more of my 26 projects I brought with me. Stay tuned for posts about those. Thanks for clarifying what on earth LQS is lol! Rocco shows off the quilt beautifully! Take him along to the sale too lol!